If you’ve been on this planet for more than a couple of decades, you probably have boxes of 35mm slides, negatives, and photo prints collecting dust in your back closet. You'd love to convert them to a digital format, but feeding one slide after another through a scanner is a painfully boring way to spend every weekend for the next three months. Thankfully, there are less-tedious ways to convert your old images to something far more usable in the digital age. Rather than letting your old photos continue to get older in a shoebox, you can ship them off to an online scanning service. For pennies per photo, you can let someone else transform those inaccessible memories into digital images you can share and enjoy as if they were taken yesterday. That sounds great in principle, but there are a lot of scanning services out there, and they all look similar on paper. To help you pick the right one for your needs, we put five popular scanning services to the test: GoPhoto, ScanCafe, DigMyPics, ScanDigital, and ScanMyPhotos.com. For each one, we shipped three slides, a strip of negatives (which typically contain three or four photos) and three 3-by-5-inch prints. There's more to a scanning service than just the quality of its output, so we also evaluated each site’s cost, range of services, ease of use, and total turnaround time. Read on to learn how each site fared in our tests. Strengths: Lowest price. Best image quality. Fast downloading options. Weaknesses: Scans and order returns weren’t well-organized. Cost for three slides, three negatives, and three prints: $24.14. ScanCafe is poised to save you money, clocking in with the cheapest per-image rate of 29 cents for a 600 dot-per-inch (dpi) photo scan. That price even drops to 22 cents per image if your order exceeds $130. When you order, ScanCafe asks for a 50-percent deposit and prints a UPS shipping label for you. When your scans are complete, you can review them online and reject images that you don't want to pay for. Want your photos fast? ScanCafe is a good option (not as fast as ScanMyPhotos, but I'll get to that). The service allowed me to download the completed full-resolution scans from its site, so while I was waiting for most of its competitors' offerings to show up in the mail, I had already downloaded my photos from ScanCafe. Of course, this might not be entirely practical if you are converting thousands of photos, but it was great for a small order. Any other concerns disappeared when I reviewed the scanned images: ScanCafe did a superb job with breathing new life into old slides, negatives, and prints, thanks to excellent color adjustments and tasteful saturation. One print in particular, a 1990-vintage 3-by-5 print of a Christmas tree that was originally processed to look more brown than green, popped with natural color. Overall, ScanCafe took the prize for the best image quality. While ScanCafe returned the order in a rigid box packed with foam, the original slides and prints were loose. We can only assume that if your order includes 1000 slides, they’d pack the box with more care. (For very large orders, you can also have your photos delivered on a hard drive.) I was also disappointed that all the images arrived in one folder instead of separate locations for slides, negatives, and prints. Strengths: Very user-friendly. Among the least-expensive services. Good image quality. Weaknesses: Slide/negative scanning maxes out at 2000 dpi. Photos can look oversharpened. Cost for three slides, three negatives, and three prints: $24.72. With a few exceptions, all scanning services charge roughly the same amount--in the neighborhood of half a buck per photo. However, the differences add up, especially when you deal in volume. GoPhoto, for example, charges 44 cents per image. That’s about average in terms of price, but slides and negatives are scanned at 2000 dpi, which is the lowest maximum resolution of all these services. Shipping charges are a flat fee of $20 per order for a round trip, regardless of how many images are in your order. As with most of these services, you print the outgoing label as part of the ordering process. Keep in mind that our quoted shipping costs are a bit misleading. When you need just nine images scanned, as we did for our testing, the lion's share of the expense will be in shipping. If you're sending hundreds or thousands of slides, negatives, and prints, the cost of each scan adds up, and the shipping costs become relatively insignificant in comparison. GoPhoto is somewhat unique in that you don't pay for anything until the order is complete. You review your images online, select the ones you want to keep, and then pay when the order is ready to be returned. Don't worry about Draconian shipping rules, either. GoPhoto doesn’t insist that you organize your photos in any particular way; you can even send your slides still loaded in trays or carousels. Our originals were shipped back in a sturdy box, and all our scanned images came on a single DVD in a full-sized case. A "Web-friendly" subfolder included a second, low-resolution set of all the photos. Image quality was good overall; GoPhoto clearly performed some color correction, but I was disappointed that details were routinely lost in shadows, something I would have corrected had I scanned the photos myself. The images also appeared to be somewhat oversharpened, which was apparent when I examined them at high magnification. Strengths: Best resolution options. Real-time order-status updates. Good image quality. Weaknesses: Expensive. Confusing order form. No prior notice of shipping charges. Cost for three slides, three negatives, and three prints: $45.35. DigMyPics offers the most options for scanning resolution, with slide- and negative-scanning options of 2500 dpi, 3200 dpi, and 4000 dpi. The services range in price from 39 cents to $1.19 each, depending on the resolution and the type of slides you send in. Prints can be scanned at 300 dpi (39 cents apiece) or 600 dpi (49 cents apiece). Another cool distinguishing factor: You can follow the status of your order by watching your photos as they're scanned and see notes made by the techs as they work on your order. I didn't get to experience this, as my test order was so small that it was completed before I could go online to check it out in progress. Despite all that, DigMyPics is rough around the edges. The order form is a bit overwhelming, which means you’ll probably need to fill it out for the less technically inclined photographers in your family. You also don't get any indication of what the shipping will cost prior to ordering. If you choose the highest-resolution output available, your order is likely to become quite pricey. DigMyPics charges you $8 for each CD or DVD onto which your images are burned, while the other services in this roundup throw those in at no additional cost. All in all, DigMyPics turned out to be quite costly. When returning my images, DigMyPics carefully packed the slides, negatives, and prints in three separate zip-lock bags, but the whole order came in a soft FedEx envelope rather than a rigid box. I suspect they'd pack a large volume of photos differently. I took advantage of DigMyPics’ 4000 dpi scanning option for slides and negatives, and the higher resolution is evident when zooming and cropping the images. There's significantly more detail to work with. The color rendition is also superb, with natural and realistic colors throughout. That said, I did notice some minor gunk (that's the technical term) on the slides that I would have expected the service’s Digital ICE noise- and scratch-removal process to eliminate during scanning. Strengths: Widest range of scanning and delivery options. Among the least-expensive services. Weaknesses: Slowest turnaround time. Worst overall image quality. Cost for three slides, three negatives, and three prints: $25.80. ScanDigital tries to simplify the ordering process by asking you to make a number of binary decisions via friendly radio buttons. For instance, you can pick between “normal quality” (2000 dpi slides and 300 dpi prints) or “highest quality” (4000 dpi and 600 dpi), standard per-image pricing or bulk rates, and so on. However, that can lead to some frustration, depending on what kind of scanning project you have in mind. If you have a combination of source material, you need to create multiple orders and ship photos and slides separately. That said, you can ship your order to ScanDigital in your own packaging or you can opt for the company's custom shipping kit, which includes a UPS shipping label, box, padding, and waterproof packaging for $10. And while most of these sites have roughly the same array of services (all of them offer video-to-DVD and film-to-DVD conversion, as well as scanning all sorts of now-obsolete formats for slides and negatives), ScanDigital had the broadest offering by a nose. Need Betamax, Disc camera (remember those? ), or stereo-slide conversions? ScanDigital can get the job done. When it comes to getting your photos back, you can have them delivered on a hard drive, a preloaded digital photo frame, or a DVD video slideshow. Alas, ScanDigital is a poor communicator. At no point during the production did they send a receipt for the total charges, and a website glitch prevented me from accessing my account during the entire test period. Indeed, I never saw the final bill until a printed receipt arrived in the return package. Also in the box: A handwritten thank you card and a free shipping label for the next order, as well as instructions for how to access an online copy of my photos. It would have been convenient to know about the online copies days earlier so I could have downloaded my images while waiting for the return package. Sadly, ScanDigital gets a D for timeliness. After receiving my package, the company estimated a completion date that was about a month beyond my deadline for this story--a time period that was twice as long as any of the competition. When I requested expedited service for an additional $15, the estimated delivery date became comparable to ScanCafe and DigMyPics. Even so, ScanDigital was unable to hit its own promised date, and its package was the last to arrive. To my eyes, ScanDigital also had the lowest overall image quality. The images were certainly acceptable, but the prints, in particular, showed too much contrast with a significant loss of detail in the shadows. Moreover, a lot of detail was lost due to a combination of the relatively low scan resolution and what appears to be an aggressive amount of JPG compression in the final images. Photos were noisy and weighed in with miniscule file sizes. All nine images together weighed a mere 12MB, compared to 110MB for DigMyPics’ higher-resolution output. Strengths: Quickest turnaround by far. Decent image quality. Weaknesses: Expensive unless you order in bulk. Confusing site. Limited delivery options. Cost for three slides, three negatives, and three prints: $43.59. 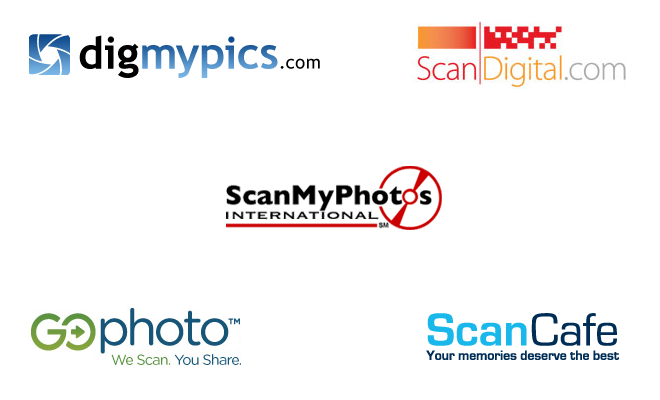 ScanMyPhotos made some significant improvements to its service over the short span of our testing. To place an order, I initially had to complete an arduous online form. Then, as if the site were trapped in amber, I had to print the order form and put it in the mail. By the time I sat down to describe the process for this review, ScanMyPhotos had added the ability to complete an order online. Even so, the site remains difficult to navigate. ScanMyPhotos offers a variety of shipping options, such as prepaid scanning boxes, a "Family Generation Collection" for scanning as many as 10,000 photos at once, and the usual pay-per-scan (which is what we tested). It's hard to directly compare each of these options, and you have to create separate orders for slides, negatives, and prints. Overall, it's simply exhausting to use this site. I also wasn’t jazzed about the fact that ScanMyPhotos insists on minimum fees. Despite rock-bottom per-item charges (12 cents per photo and 27 cents per slide), there's a $20 charge for any photo-scanning projects and $5 each for slide- and negative-scanning projects. That's not a concern if you're sending photos in bulk, but it makes no sense to use ScanMyPhotos if you need to scan fewer than about 150 photos. While most services offer a range of delivery options, all you get here is your photos on DVD and the option to archive them online for up to a year. On the other hand, ScanMyPhotos gets an A+ for turnaround time. Indeed, when ScanMyPhotos notified me that they had shipped a package to me just two days after I dropped my test photos in the mail, I assumed they had rejected my slides due to improper packaging. Their rules about how you need to pack and organize your materials read like they were written by Seinfeld's Soup Nazi. But nope, I actually had a completed order in hand after just five days, and that included a weekend. Image quality was quite good, but just average among the services. The prints were among the best I'd seen in this test, but the slides appeared to lack the "punch" that would have resulted from some color and saturation enhancements. The order came in a padded envelope with three DVDs (one each for prints, slides, and envelopes) in paper sleeves, as well as a nearly illegible receipt that had apparently been printed with the “Toner Low” warning flashing. Here's how each of the services compared in our testing, ranked from 1 (best) to 5 (worst) in each of our testing categories. As you can see, each site has its own comparative strengths. This story, "The best and worst services for digitizing your photos" was originally published by TechHive.